Expand Categories in left Navigation Bar and click on Manage to open manage categories screen. ID is the serial number of a category in the knowledge base. Name: This column displays the name (title) assigned to a category. Root category is displayed at top and sub-categories are displayed underneath it. Priority: This column lets you set custom precedence order of categories in front-end. Categories are listed from lower to a higher priority in the front-end area i.e. lower the priority number, higher is the category position in front-end area. Please note that category priority would be effective only if the Sort Order of categories is changed from "Alphabetic order" to "Priority" in Feature Settings (under Manage Settings) section of the admin area. Visible: You can turn on/off the visibility of a category in front-end through this column. By default, current category status is visible. To change, the visibility status, click on the YES/NO label. 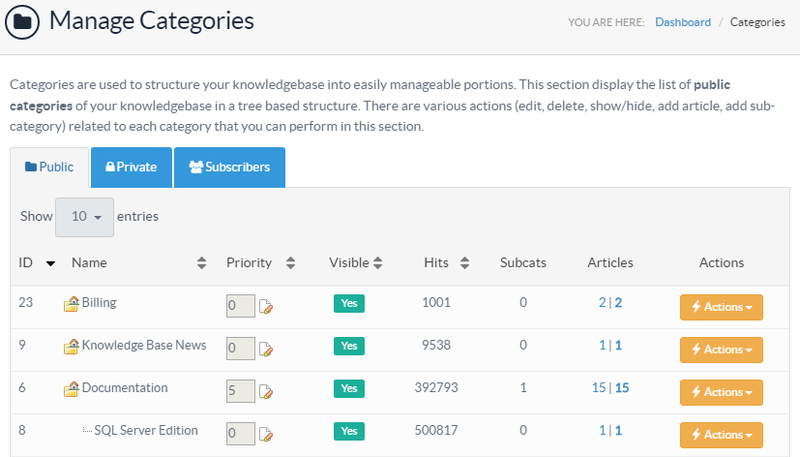 Hits: Hits depicts total views of all the articles under respective category and its sub-categories. Subcats: This column shows the total count of sub-categories of a category. Articles: This column contains two values separated with a pipeline (|) symbol. The first value shows the total count of the published articles (approved and featured) and second value depicts the total count of all articles (irrespective of their status) present under this category. Edit - Click to modify a category. Delete - Click to delete the selected category. A category can only be deleted if it is empty (does not contain any subcategories or articles) else the system will generate warning messages. Add Subcategory - Click to add a new sub-category under it. Add Article - Click to add a new article in this category. Subscribers - Click to manage the list of subscribers (See: Managing Category Subscribers ) of this category.